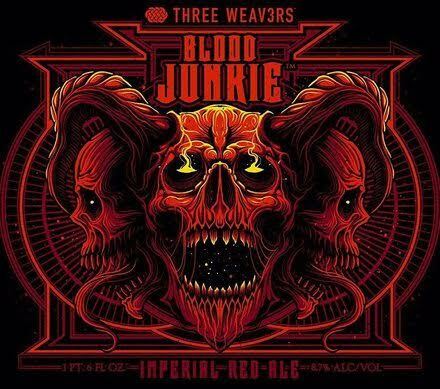 THREE WEAVERS BREWING COMPANY has teamed with their friends and neighbors at PROSTHETIC RECORDS to combine their love of beer and heavy metal by brewing and bottling the Blood Junkie Imperial Red Ale. Roping in acclaimed artist and fellow beer aficionado Dan Mumford (The Black Dahlia Murder, Parkway Drive) to design the bottle's menacing artwork, the bottled version of Blood Junkie will make its debut on November 21st. Sharing a common affinity for assertively hopped ales, Three Weavers Brewmaster Alexandra Nowell and Prosthetic co-founder E.J. Johantgen melded minds and sought to develop a ruby-hued imperial red that is big and malt-driven, yet dry and balanced. Johantgen commented, "I have been obsessed with beer and the process of making beer for years - almost as long as I've been obsessed with metal. Alex and Three Weavers are even more passionate about making some of the best beer imaginable. So it only made sense that the hop-heads here at PROSTHETIC be a part of something as special as Blood Junkie. We are very proud of the result and think fans of craft and metal will be equally pleased." To commemorate the special event, PROSTHETIC and Three Weavers will host a "bottle-release party" at the brewery's tasting room in Inglewood, California on Saturday, November 21st featuring live entertainment provided by Prosthetic's own heavy metal group Exmortus along with support from Three Weavers brewer Chris' progressive rock quartet LITAOA. Additionally, a limited amount of exclusive t-shirts featuring the bottle's artwork will be available for purchase on site. Doors open at 8:00 and tickets will be available at the door for just $5. For more information, please RSVP at https://www.facebook.com/events/494808434032718/. Blood Junkie is built on a grain base of 2-row, Munich, and a healthy dose of British crystal malts for color and body, coming in at 8.7% and 70 IBUs. The beer is then double dry-hopped to the hilt with a combination of Mosaic, Simcoe, Summit, and experimental hop variety 342, giving Blood Junkie a bright, tropical hop character and a distinctly west coast spin on the imperial red style. Three Weavers is a craft brewery based in Inglewood, California. Founded in 2013, they are deeply rooted in the concept of responsibility--to the environment, to the industry, to the community, and to their employees. Three Weavers exists to share their love and appreciation of beer with the world.